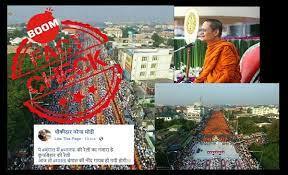 An aerial photo showing rows of Buddhists monks in Thailand receiving alms from a crowd is being falsely shared as the turnout at a Bharatiya Janata Party (BJP) rally in Cooch Behar, West Bengal. The archive of the Facebook post can be viewed here and here. BOOM ran a reverse image search on the photograph and found that it is originally from an alms distribution ritual that was held at the Samut Sakhon provice in Thailand in October, 2015. The government and private sectors of the province organised the second alms offering ceremony for the residing monks. 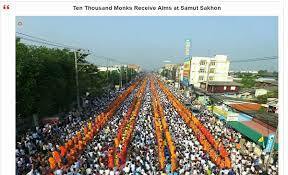 Alms were distributed to 10,000 Buddhist monks who had come from nine nearby provinces. The image, along with several other images from the ceremony, was uploaded on dmc.tv, a religious channel on Buddhist teachings. We also found a 2015 Facebook post from a verified account featuring the same image. 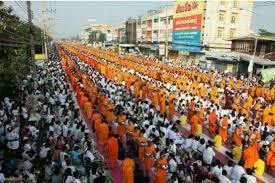 Another photo of the same street clearly shows that they are Buddhist monks and not BJP supporters. Prime Minister Narendra Modi held a rally in Cooch Behar on April 7, 2019 which saw a large turnout. (see the video below) However, the image shared on Facebook groups is from Bangkok. India acts strongly against the forces of terror. India strengthens its position as a space superpower.